Art Hostage: Stolen Art Watch, Fitzwilliam & Durham Museum Jade Heists, Jail Looming, Recovery Partial !! Art Hostage Services - The Art Hostage team undertakes a wide range of services, including due diligence, collection conservation and management, risk assessment and security as well as legal issues, recovery and dispute resolution involving art and artifacts. Through partnerships with leading organizations, the Art Hostage team can provide a complete service for all aspects of collecting and protecting art. Stolen Art Watch, Fitzwilliam & Durham Museum Jade Heists, Jail Looming, Recovery Partial !! A boy aged 15 is among four people who have admitted a role in the daylight raid of up to £15 million worth of Chinese artefacts from the Fitzwilliam Museum. Marvin Simos, from London, has admitted breaking into the Trumpington Street museum and taking valuable Chinese art worth between £5 million and £15 million – none of which has been recovered. He appeared at Cambridge Crown Court yesterday jointly charged with Patrick Kiely, 29, Steven Coughlan, 25, both of Eleanor Street, London, and Robert Smith, 24, of Rosedale Stables, Swanley, Kent. Kiely, Coughlan and Smith pleaded guilty to conspiracy to burgle the museum – after they were caught on CCTV casing the joint the day before the raid. They were seen examining two cabinets containing the Chinese artefacts as well as the window that was smashed to get into the building. Simos, of Victoria Dock, London, pleaded not guilty to conspiracy to burgle – which was accepted by the Crown. The break-in occurred at about 7.30pm, on Friday, April 13, taking just a matter of minutes. CCTV footage showed Simos arriving at the museum with three other men in a white VW Caddy van, which was parked near the museum and thought to have been stolen from Tower Hamlets in London on April 7. The gang walked around the back to a ground floor window and used cutting equipment to cut through metal shutters before breaking the window and entering. They then smashed through two strengthened glass cabinets before leaving with the artefacts, which are mostly jade, and driving off in the van, which was seen near the Hotel du Vin at 7.38pm. The artwork was part of the museum’s permanent collection – none of which has been recovered despite police forces being alerted worldwide. Taxi drivers and diners were initially called upon by police in the hunt for the suspects as 25 dedicated officers and staff undertook the high-profile investigation, called Operation Tundra. Specialist officers from the fine art and antiques division of the Metropolitan Police assisted Cambridgeshire detectives in the case. CCTV images were shown on BBC1’s Crimewatch programme in an appeal for information. Det Ch Insp Jim McCrorie yesterday praised officers who worked on the operation for their “hard work” and said they would continue to search for the stolen art. The defendants have been remanded in police custody and will be sentenced on or around September 28. >> ART experts say the artefacts were probably stolen “to order” and are unlikely to ever be recovered. Guy Schooling, managing director of Sworders Fine Art Auctioneers in Stansted Mountfitchet, thinks they are likely to be in China – bought by buyers determined to see their heritage repatriated. He said: “The end market for these objects is mainland China. “The increase in values of Chinese works of art is driven by Chinese buyers themselves. The haul of 18 artefacts included Qing, Qianlong and Ming artworks, including a jade 16th century carved buffalo which alone could be worth £4 million. Jade is supposed to bring good fortune in Chinese culture. The majority of the stolen treasure was bequeathed to the museum by Oscar Raphael in the 1940s and included six pieces made during the Ming dynasty. Peter Crabbe, an expert in oriental antiques, has a shop in Pembroke Street opposite the museum and estimated that most of the pieces are “probably worth £250,000” adding a similar recumbent buffalo “went for £4 million at auction”. David Battie, a British expert in Chinese and Japanese ceramics, who has worked for Sworders as well, said the objects would have been made for the Chinese Literati – scholars who ran China and developed works of art, poetry and calligraphy. The items would have been designed to use on a writing table – brush pads to hold brushes and recumbent animals to rest brushes on. The BBC’s Antiques Roadshow star previously told the News “without a doubt these have been clearly stolen to order for the Chinese market”. However, Mr Schooling disagrees as he thinks it was more of an “opportunistic crime”. He said: “The defendants have seen the items there, realised that it would be possible to steal them now that there is a pretty ready market for these things and not too many questions asked. A 15-year-old boy has pleaded guilty to stealing "culturally significant" art from a Cambridge museum. The boy, who cannot be named for legal reasons, admitted burgling "ancient Chinese antiques" from the Fitzwilliam Museum in April. Three men - Patrick Kiely, 29, Steven Coughlan, 25, both from east London, and Robert Smith, 24, from Swanley in Kent - admitted conspiracy to burgle. All four will return to Cambridge Crown Court in September to be sentenced. Kiley and Coughlan, both of Gypsies Residential Site, in Eleanor Street, Bow, east London, and Smith, of Rosedale Stables, Swanley, were remanded in custody, as was the boy. Eighteen items, mostly jade and from the Fitzwilliam Museum's permanent collection, were stolen. No value was placed on the haul during the latest court hearing but it was estimated to be worth several million pounds by police. 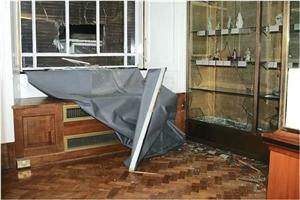 The University of Cambridge museum described their loss as a "great blow". A spokeswoman for Cambridgeshire Police said the "culturally significant" art had not been recovered. Among the stolen items in Cambridge were six pieces from the Ming dynasty, including a jade 16th Century carved buffalo, a carved horse from the 17th Century and a green and brown jade carved elephant. A jade cup and vase which is carved with bronze designs was also stolen along with an opaque jade brush washer. A Volkswagen Caddy van stolen from the Tower Hamlets area of east London on 7 April was used in the raid, which happened at about 19:30 BST on 13 April. The gang entered the museum via a back entrance after using a disc cutter to create a hole in a back wall. Three men and a teenage boy have admitted their involvement in a burglary which saw millions of pounds worth of ancient Chinese artefacts stolen from a Cambridge museum. Marvin Simos, 15, of Hanameel Street, Victoria Dock, London, has admitted breaking into the Fitzwilliam Museum on April 13 this year and taking items worth between £5 million and £15 million. He appeared at Cambridge Crown Court today jointly charged with Patrick Kiely, 29, Steven Coughlan, 25, both of Gypsies Residential Site, Eleanor Street, London and Robert Smith, 24, of Rosedale Stables, Swanley. Kiely, Coughlan and Smith pleaded guilty to conspiracy to burgle the museum. They have been remanded in police custody and will be sentenced on or around September 28. SIX people have admitted their part in the theft of rare artefacts from Durham University’s Oriental Museum. The gang, from Walsall in the West Midlands, smashed a hole in the wall of the museum in Elvet Hill and snatched a jade bowl and porcelain ornament valued at £2million. Police used CCTV footage and number plate recognition cameras to track the gang, first to Meadowfield on the outskirts of Durham City and then to Walsall. The stolen ornaments were found by a member of the public under bushes on waste ground at Browney, a small settlement near Durham City. They had been lying unwrapped for eight days. At Durham Crown Court yesterday, Adrian Stanton, 32, of Telford Road and Lee Wildman 35, of Remmington Road, admitted conspiracy to burgle between January 1 and April 6. Justin Oliver Clarke, 32, of Tamar Close, admitted two charges of assisting an offender. The court heard he was in Durham when the theft took place on April 5 and helped the others by driving cars. Fallon Arrowsmith, 19, of Walker Road, Charmaine Wilkes, 27, of Cornwall Close, and Natasha Partridge, 21, of Remmington Place, also admitted assisting an offender, between April 5 and May 11. Stanton and Wildman were remanded in custody. The other four were bailed to return to the court to be dealt with on August 31. Send a personal comment to Art Hostage that will be kept strictly PRIVATE !! 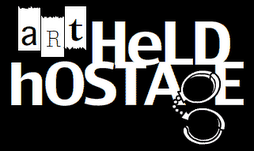 Himself a former trafficker of stolen art, Turbo Paul Hendry M.A. provides information to the readers of his blogs (including collectors, victims, insurers, and other members of the public) regarding the latest news from the world of stolen art and artifacts and, wherever possible, he assists in the recovery of art and artifacts stolen by others. Art Hostage, for the last Ten years, has provided services to private individuals, insurers, law enforcement agencies, and to those who have information that will lead to the recovery of stolen art. Tales of the Unexpected, one for the Underdog ! !